I’m always looking for healthy snack ideas for Evan. I’m not sure about you, but sometimes I feel like I’m giving Evan the same snacks over and over again…goldfish, bananas, cereal, crackers etc. 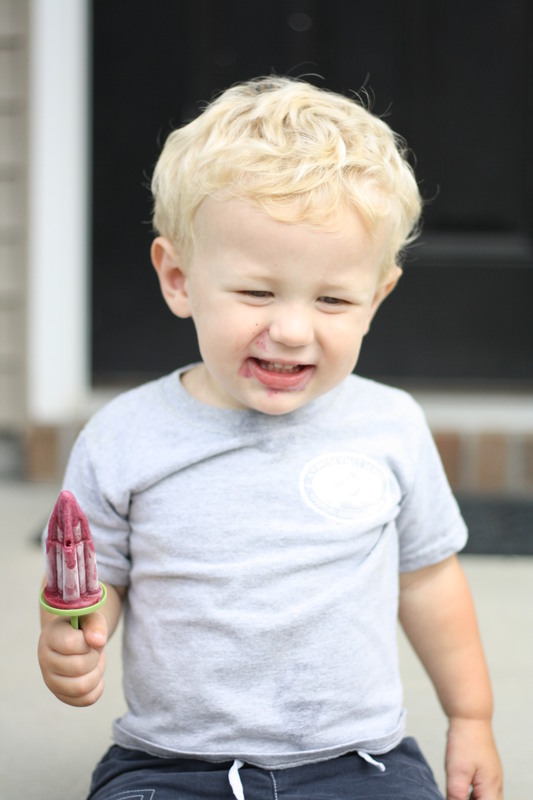 So I was really excited when my neighbor, Amy, told me about these yogurt popsicles. 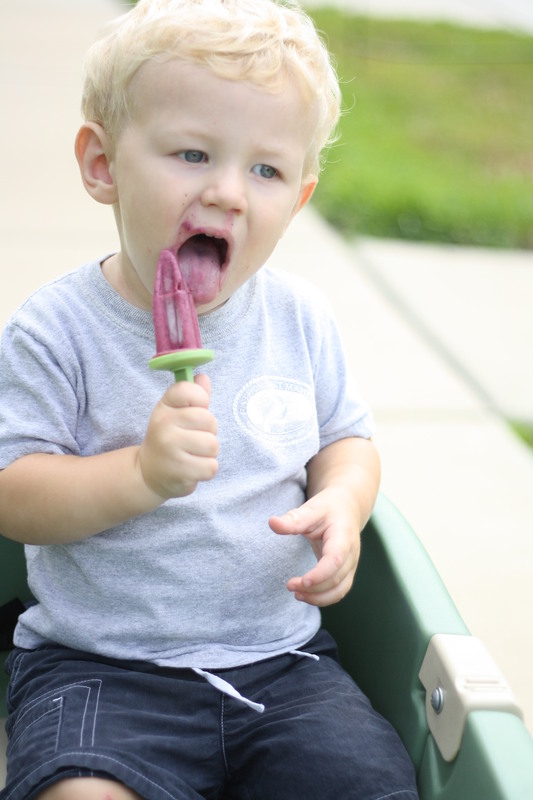 Plus, they make for a cool treat in this 90 degree weather. 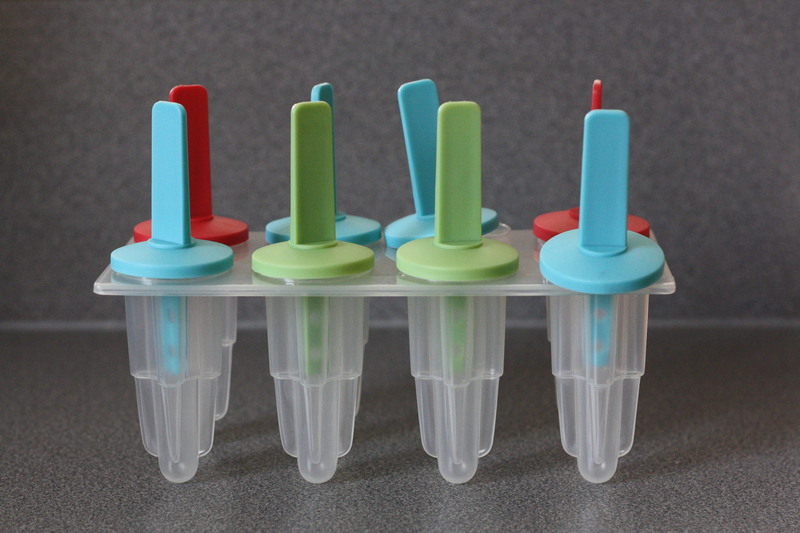 I bought my popsicle trays at Wal-Mart for a little over $2.00. I searched every aisle at Target and could not find them there…so I’m giving all my Target lovers a heads up! 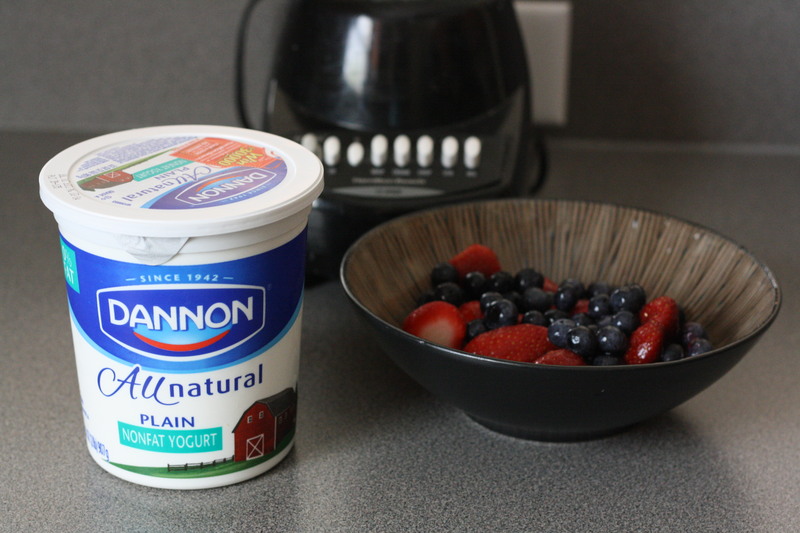 I thought about making homemade yogurt but quickly changed my mind when I saw that it required a heating pad! Instead, I opted for the easy way out and bought plain yogurt. 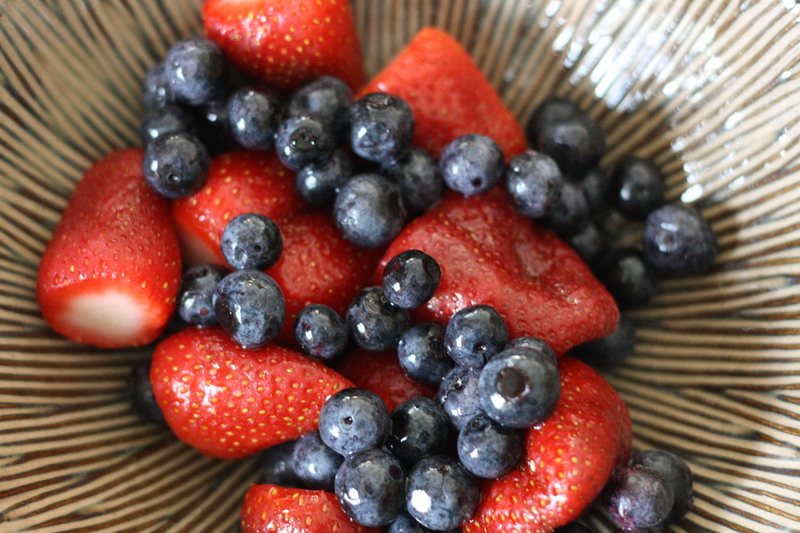 Place berries/fruit in blender and puree. 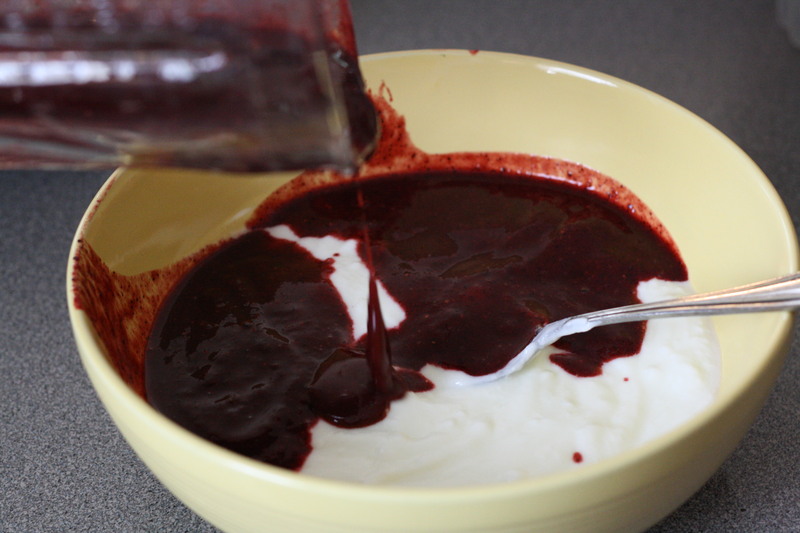 Once liquified, mix with yogurt in a bowl. 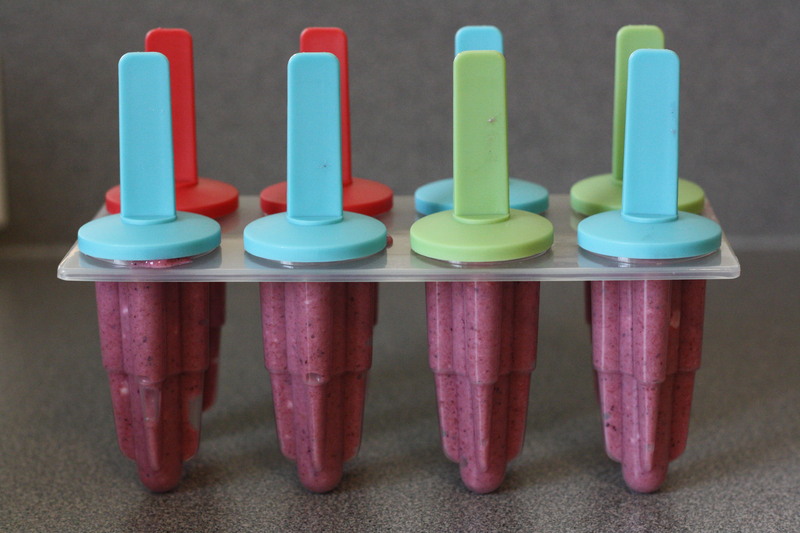 Pour in popsicle trays and freeze. Any leftovers you have you can place in containers. I had leftovers and ate mine the next morning for breakfast. 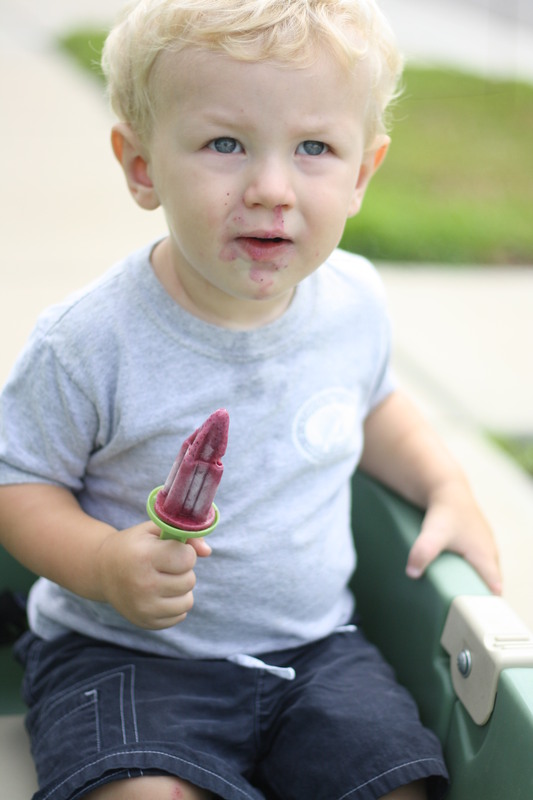 Here’s how we eat our popsicles ! And this is how we wash off! On Wednesday Evan turned 18 months old! I still look at him everyday in amazement! 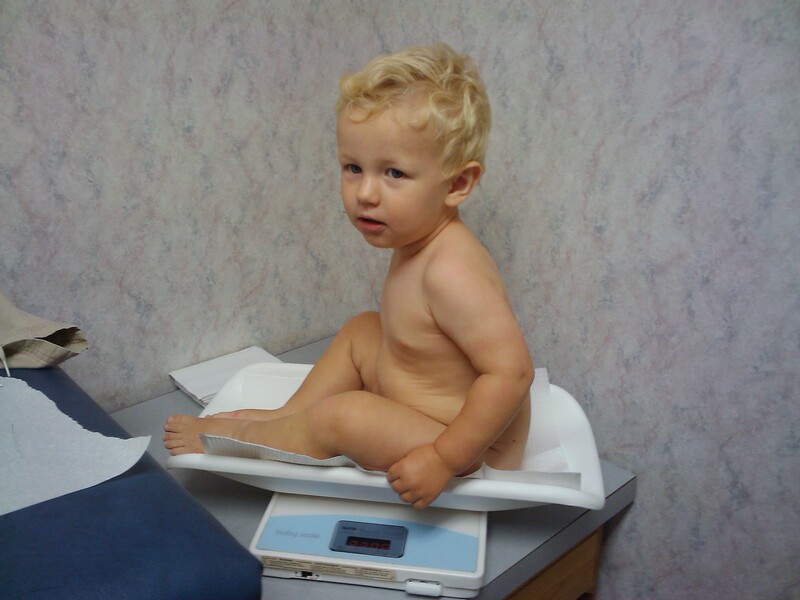 Everything went very well at his appointment. 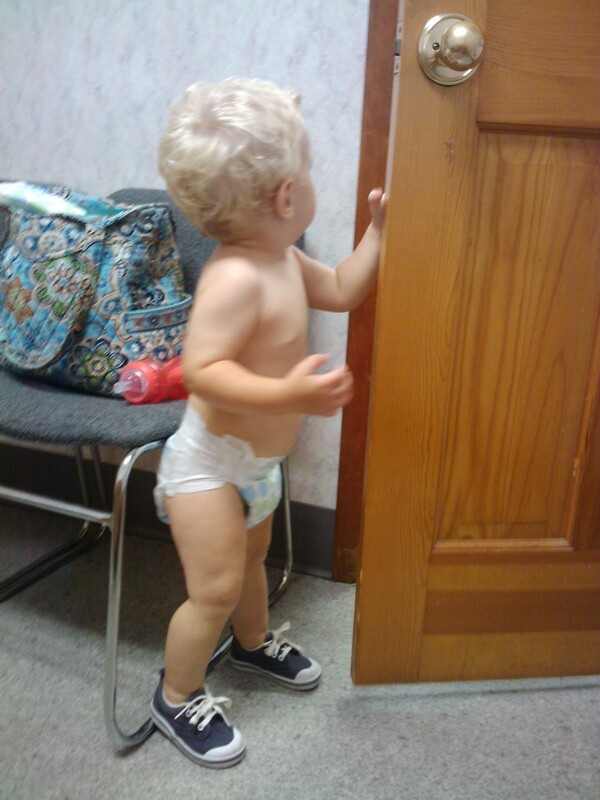 It was just Evan and I at the appointment and we always find ways to entertain ourselves while waiting on the doctor. He knows how to open doors now…and can you believe he only tried to escape about 22 times while we waited for the doctor? 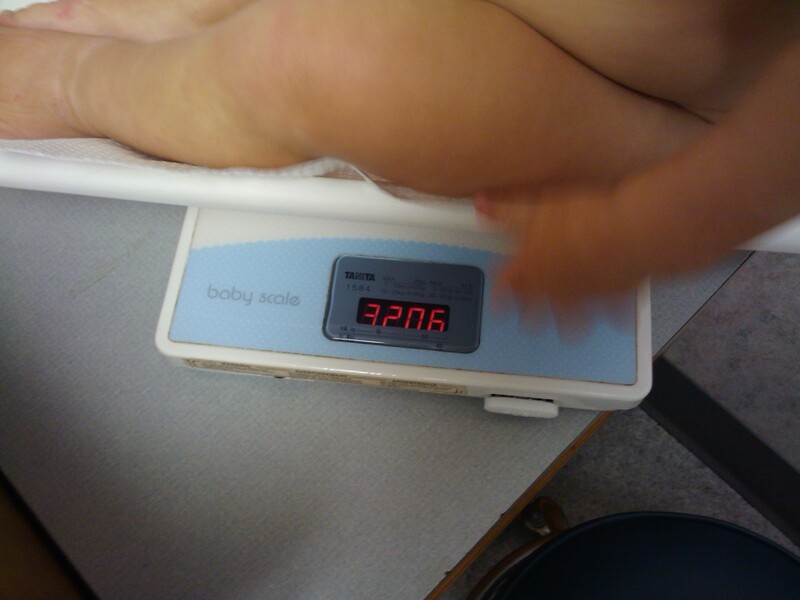 My baby only gained 6 ounces since his 15 month appointment. Can you believe it? He is getting so skinny! 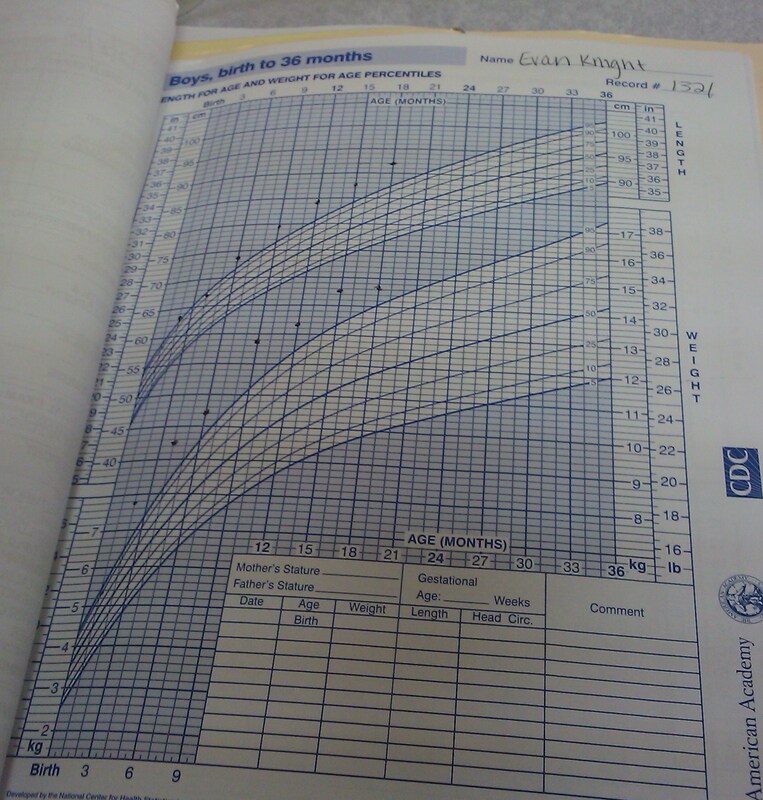 And here’s his head circumference measurement. 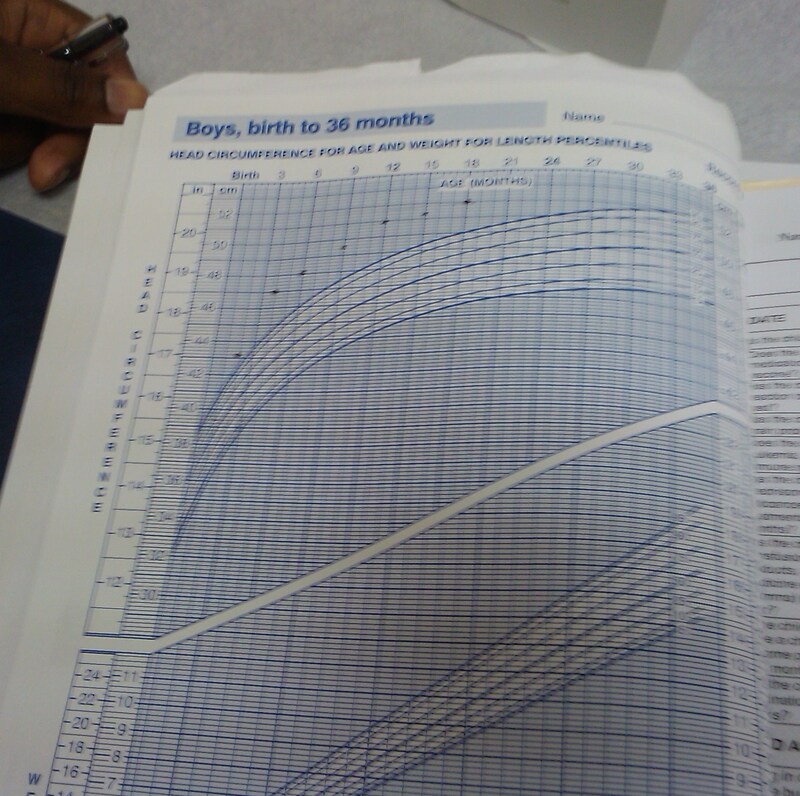 When I look at this particular chart, I just like to remind myself that my child has a very large head to house his very large brain that will one day hold all the answers to saving mankind. This 18 month stage has brought on new beginnings for us. For instance, jeans. 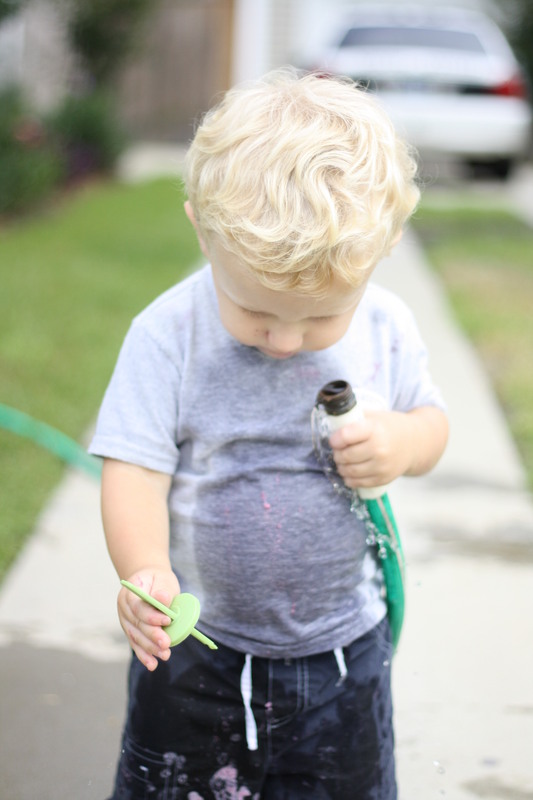 Evan has never, ever been able to wear jeans or any clothing bottoms with a button and zipper. We always had to buy him clothing with elastic waists. I just can’t get over him in jeans! Target had these jeans on sale for $4.00 so I figured I would pick up a pair and see how they fit on him. 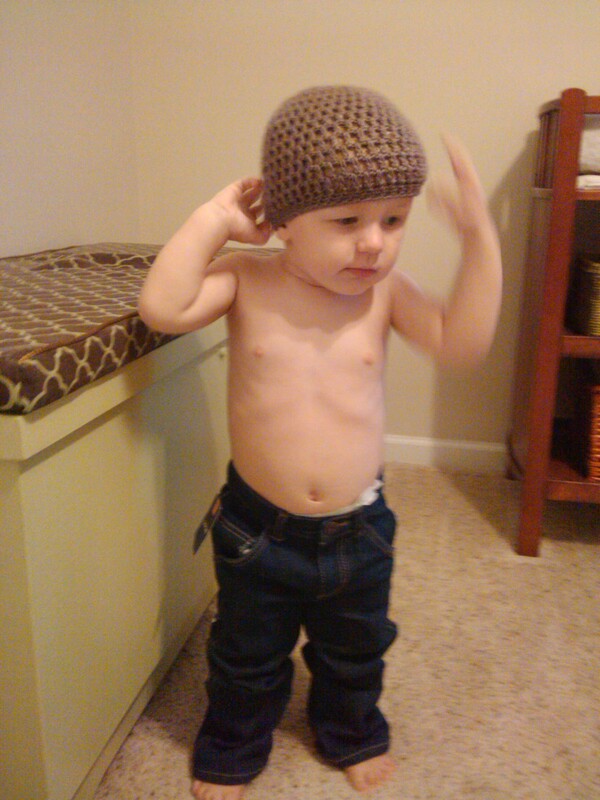 They are a size 3T and I think he looks way too mature in them. I think I will revert back to onesies and stretchy pants! It’s over and we had fun! Lovebug and I headed out of town on Friday to stay with my grandparents in North Carolina. 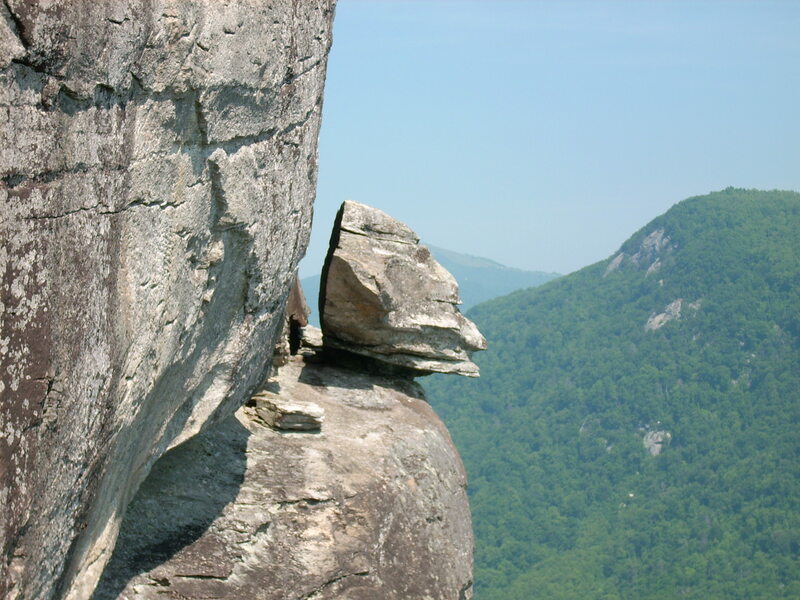 Their home is near the Chimney Rock / Lake Lure area and is conveniently located to numerous attractions. It’s always nice to be able to visit with them and explore! Saturday morning we woke up early and had plans for rafting the French Broad river. The area where we launched from is only about thirty minutes north of Asheville. 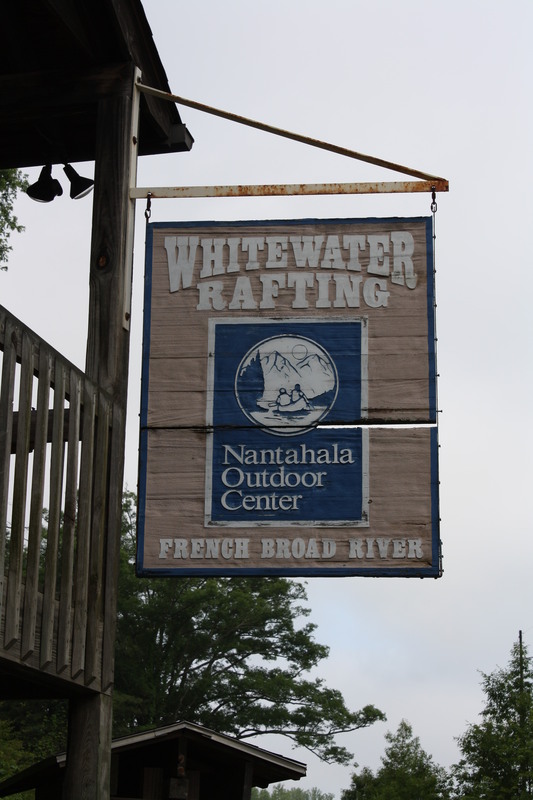 We booked our reservations through the Nantahala Outdoor Center and were very pleased overall. If you are interested in white water rafting, go check them out! For the rafting expedition, I decided to break out my Reefs. I wore these back in the days of my life guarding career. As you can see, the shoes lasted longer than the career. I am happy to report that we both made it down the river safely. The rapids were class II and III which were perfect for us beginners. The scenery was beyond beautiful and for a moment, it almost made me want to move there. Then that moment quickly left my mind when I remembered how car sick I get driving around the mountains. Saturday night, we decided to go into downtown Ashville for dinner. 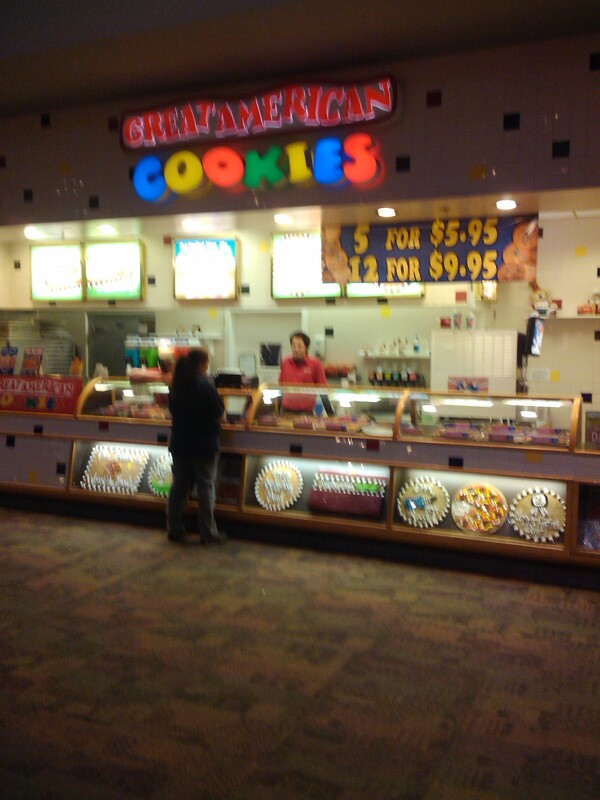 After eating we headed over to the Asheville mall. As soon as I opened the grand doors entering the mall, this is what I saw! I have been living in a state of emergency ever since the Great American Cookie Company closed all three of their locations here in Charleston. So in honor of all my peeps who are also missing their GACC cookies, I ordered the M&M double doozie and ate it all by myself! 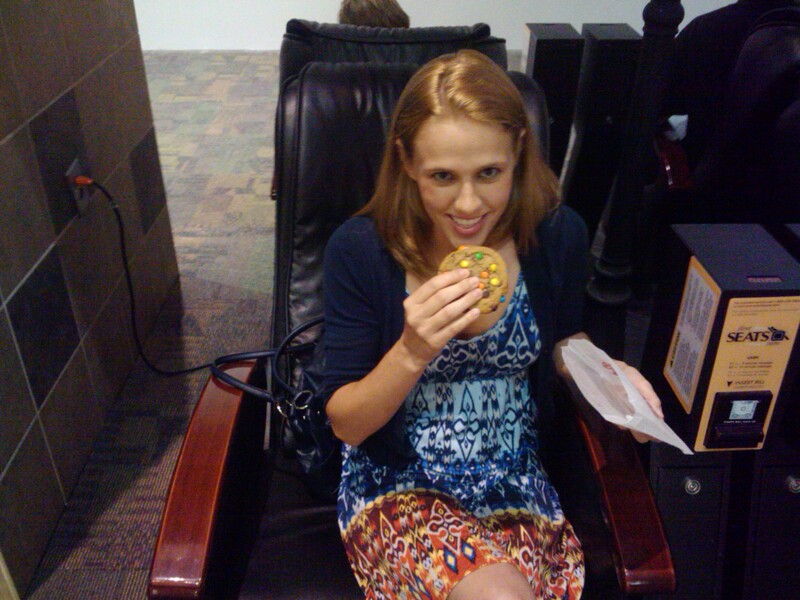 For two minutes, the whole world was in perfect harmony as I sat here in this vibrating chair and ate my cookie. And then the chair quit vibrating and Lovebug said, “Please get up, people are staring at you!” My two minutes of world peace were officially over. I got up and went back up to the counter and started chatting with one of the employees. After a long deliberation with the GACC employee, she informed me that the Charleston stores will be reopening soon! 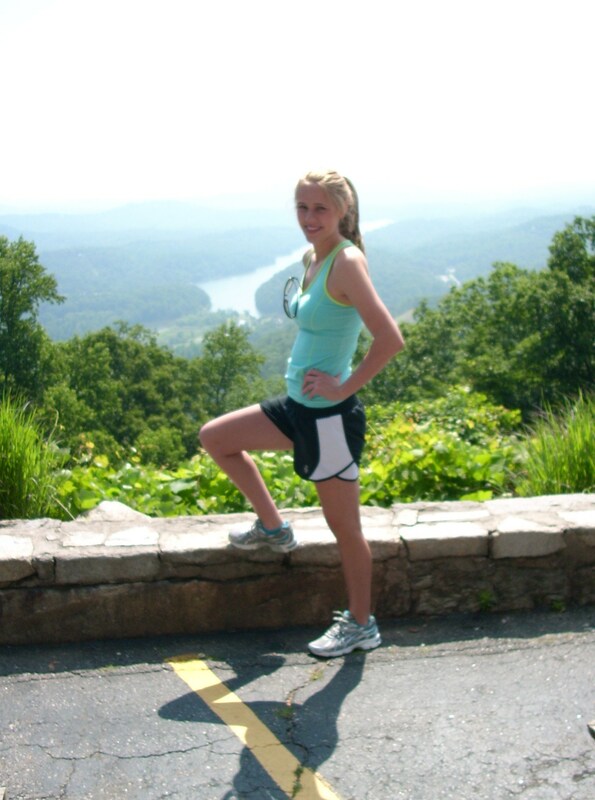 On Sunday, we woke up and headed to Chimney Rock for more hiking. Our original intentions were to “cheat” and ride the elevator to the “Chimney” and then hike more trails from there. Well, apparently it just wasn’t meant for us to be cheaters…that darn elevator was shut down for renovations! 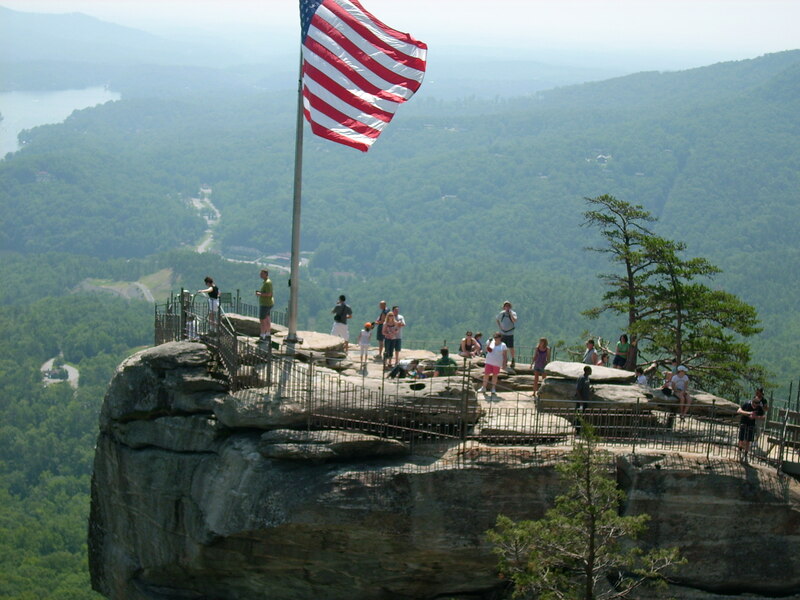 And if anyone has plans to visit Chimney Rock within the next year, be prepared to hike. Ranger Dan told me that it will be shut down until summer of 2012. This year, I went for the athletic look. 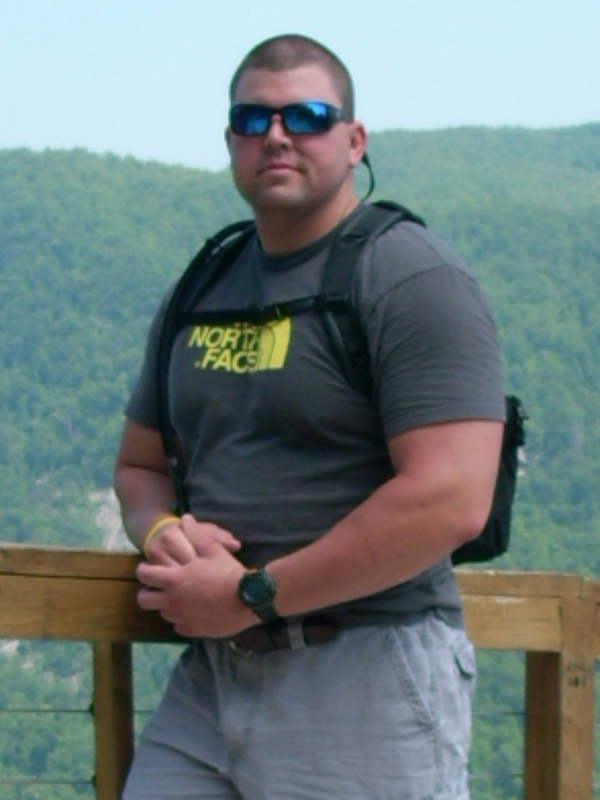 It was way too hot for the Bear Grylls look like I wore last year. I can happily say that none of these people are cheaters. 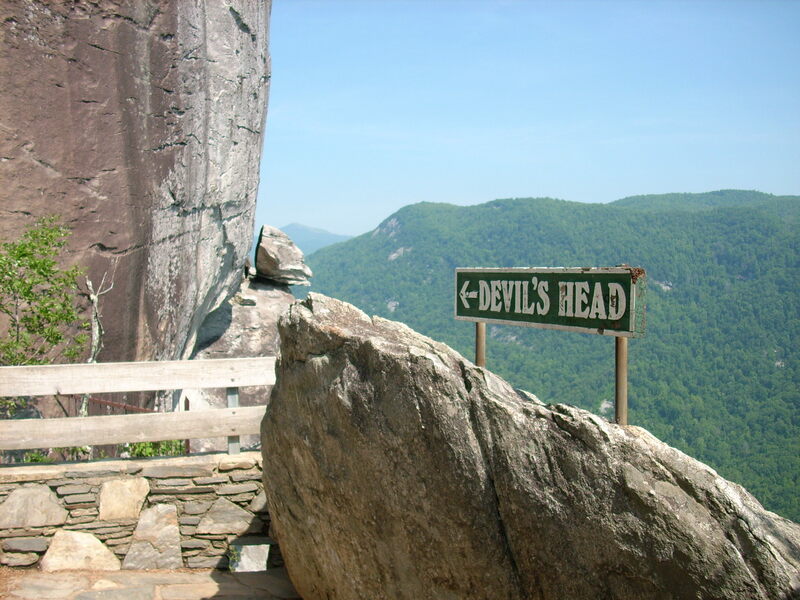 As we hiked further pass the “Chimney” we saw the “Devil’s head”. After a bit more hiking, we finally came to the ending point known as “Exclamation Point”. As a side note, they currently no longer let you hike past this point. Before, you could hike further to what’s called the “upper waterfall”. Here’s Lovebug at “Exclamation Point” with his typical Olan Mills pose. Our hike was so refreshing and invigorating. After it was all said, done and over with, I was glad the elevator was broke. Nothing is more empowering than looking back up at the mountain and seeing what you accomplished. 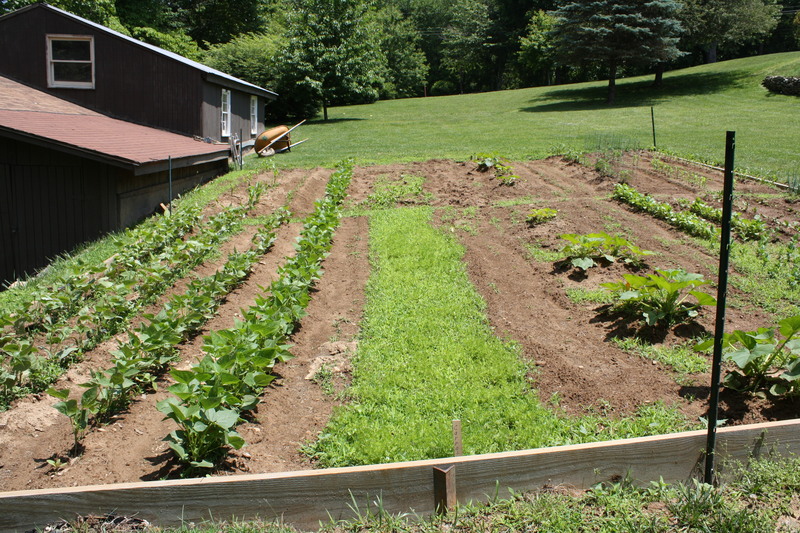 Here are a few pictures of my grandfather’s garden. Just thought I should share. 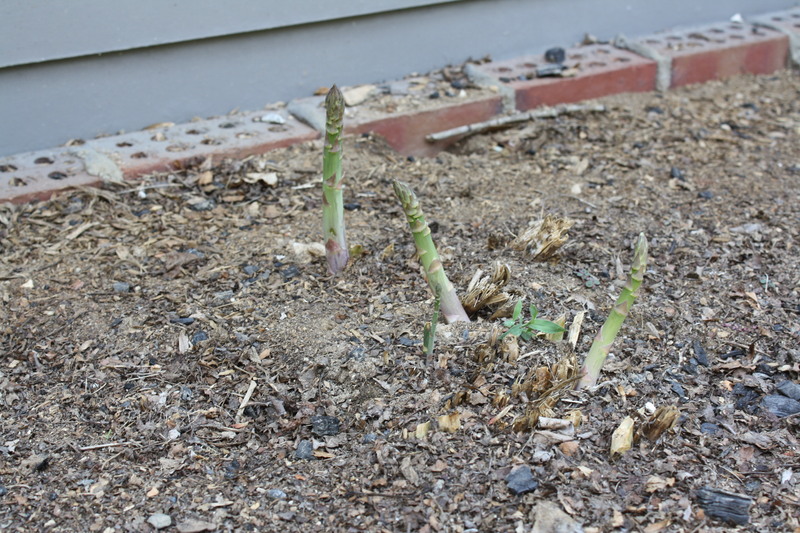 I never knew that asparagus grew like this. No leaves, no bush, no nothing…it just pops out of the ground. I was so excited when there was enough for us to take some back home. I ended up cooking it Tuesday night and I it was crazy good! 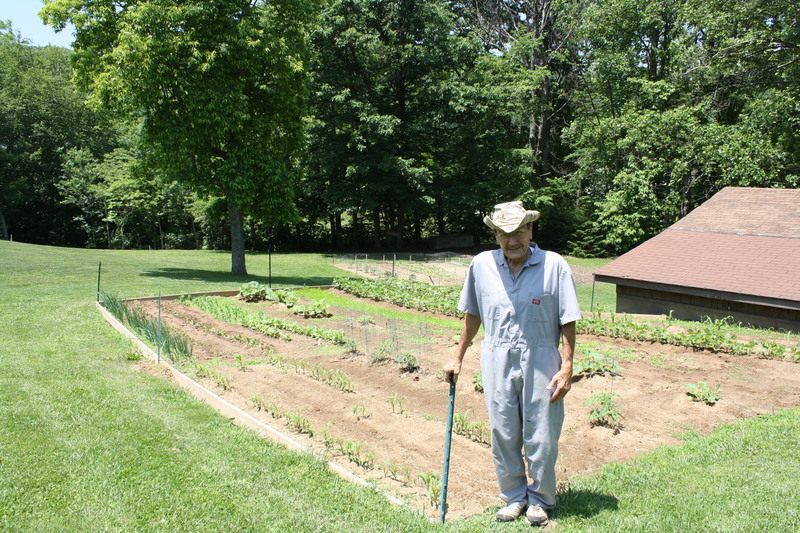 The proud farmer and his garden. Papa is 81 years old and I think he looks exceptional!